When my wife and I make trips up to Maine to visit my family we have developed a few traditions. We are trying to stick to some of these traditions even with the recent addition to our family. One is lunch at Gritty McDuff’s, the classic Maine brewpub with a solid lineup of beers and high quality food. The little man did great at the restaurant on our Thanksgiving trip, just hung out in a high chair, ate some food and enjoyed the extra attention he attracted. Gritty’s has two locations, but we usually hit the Freeport stop for a few reasons, it’s right off the highway with good parking, and it’s right down the road from Maine Beer Company. I always stop at MBC and buy a number of their delicious beers, and try to restrain myself enough that a few even make it back to Massachusetts. While it would be easy to focus my purchase on their sought after IPAs like Lunch and Another One, I always try to branch out and get a selection of offerings, I have yet to try a Maine Beer Company brew that I didn’t enjoy. One of the beers I picked up on the most recent stop was A Tiny Beautiful Something, an American Pale Ale that showcases the El Dorado hop variety. Maine Beer Company A Tiny Beautiful Something is available year round on draft and in 16.9 oz. bottles. 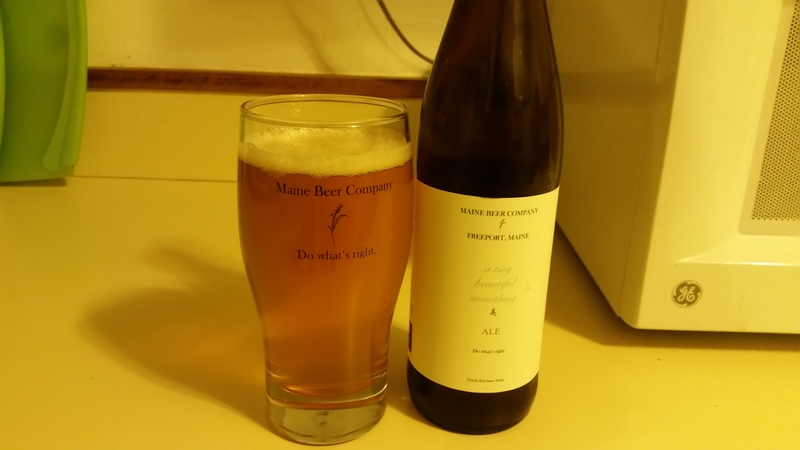 Maine Beer Co. A Tiny Beautiful Something pours a clear straw yellow with a solid white head. The scent is the pungent mixture of hop aromas that has made Maine Beer Co. beers so popular. The hops also lead the flavor, notes of orange, grapefruit, mango and papaya along with a crisp but soft bitterness. The malt backbone is very mild, just a hint of white bread and honey. At 5.5% ABV this isn’t quite a session beer, but it is very light bodied and easy to drink. The finish is very clean with a touch of lingering hop flavor on the tongue. This is a very nice new-era American pale ale, tons of hop flavor without the bitterness or booze that comes with IPAs. Everyone chases the MBC IPAs (which are delicious), but it is worth your time to try their full lineup. Hoppy Boston score: 4.25/5.